2" Drop Spindle for 58-64 GM "B" Body. 2" Drop spindle for 58-64 GM B-Body. These spindles are precision cast from high-quality Ductile Iron, with 4140 Chrom-moly CNC machined pins. Accepts the factory ball joints and stock steering arms. 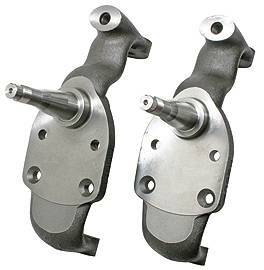 These are the best engineered, and best fitting drop spindles available for your vintage Chevy! Note: will not work with drum brakes. Baer, Wilwood and CPP offer kits for this spindle that include all of the necessary brackets.